Alecks Cruz is a self-taught artist and freelance graphic designer who works within the realm of graffiti art, creating pieces that are unbound by a single dimension. Born in Chicago, IL in 1984, Alecks started with a spray can as most graffiti artists do, but now he is fascinated with creating three-dimensional graffiti structured letters that extend outside the traditional application of the art. He explores the composition of individual letters and the unique beauty that each character has to offer. For his large-scale letterform sculptures, Cruz utilizes discarded cardboard shipping boxes as his materials. 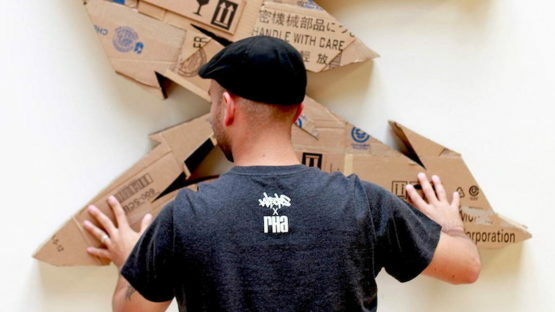 He focuses on the structural form of individual graffiti style letters, creating a framework for finer detail; embellishment with marquetry-style geometric panels fashioned from sections of the box’s printing. His latest solo exhibition “Redemption” has debuted of six new sculptures. With regard to the title of this body of work, Cruz states “just as graffiti art was forged out of penury into an eloquent art, I chose to redeem abandoned materials.” The fusion of classic style lettering and repurposed materials creates works that, in this case, are not merely crafty updates of throw-back visuals. These pieces, fashioned out of redeemed cardboard, are Cruz’s personal reaction to the co-opting of graffiti by external forces. Through the act of slicing the cardboard’s printed branding and commercial typography, destroying it, and ultimately reconfiguring it into a graffiti based form, Cruz is able to exact a measure of revenge for the distasteful marketing that threatens to reduce graffiti to cliche. Alecks Cruz lives and works in Berwyn, IL.